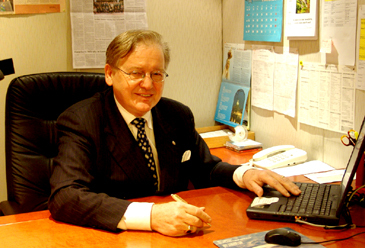 Mr. Bernhard Brender, general manager of the Millennium Seoul Hilton sits at his desk for an interview with The Seoul Times. The Millennium Seoul Hilton stands atop as one of the premiere hotels in Seoul. Yet, earning this status didn't come easy as Bernhard Brender, their general manager, explained in a recent interview with The Seoul Times. In the interview he had in his office Sept. 20, 2005, he emphasized, foremost of all, that his hotel must show care for their guests. Hilton employees want to help others and not primarily focus on their paychecks. Mr. Brender criticized businesspeople who place profit above all else. His business philosophy is called "people before profit." He explained that greater money is earned when a hotel accomplishes customer satisfaction because these clients will return often. The Millennium Seoul Hilton achieves client loyalty by anticipating all scenarios and finding innovative solutions. Accordingly, he subsidizes education at an Honor University (website) program for all employees. This costs $1000 per student. He proved creativity on his part by beginning an initiative last January called H.O.D. (Hygienist Officer on Duty). Here 32 managers are certified to report on food contamination, electrical problems and have the ability to provide emergency medical care. As a matter of fact, Mr. Brender hangs medical equipment on his wall and loves to wear his doctor's white lab coat. He enthusiastically demonstrated medical procedures during the interview. He revealed that he saved four lives in the past 10 years. 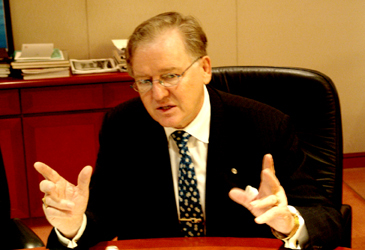 Mr. Brender's leadership played the most significant role for the achievements of the Millennium Seoul Hilton Hotel. He recognizes that he must motivate and be open-minded; lead by example and assume responsibility. He enjoys communicating with guests and has been known to greet them with a smile. His business relationship with the hotel union is congenial, even though, difficult labor and management issues plague the Korean economy. He avoids disputes by focusing on the care of his employees. Mr. Brender empathizes with them because he didn't become a well-known general manager overnight. He started his career as a chef and worked all sorts of other jobs. He climbed the ladder in the hotel industry due to hard work and curiosity. He never stopped asking questions. His life appears to be a "rags to riches" story. He was born in the Black Forest of Germany after World War II. while the nation's economy was shattered. His father had been imprisoned in the gulags of the Soviet Union. He returned home to build and run a brush factory. Nevertheless, his family did not obtain a luxury lifestyle and described experiences of abject poverty. 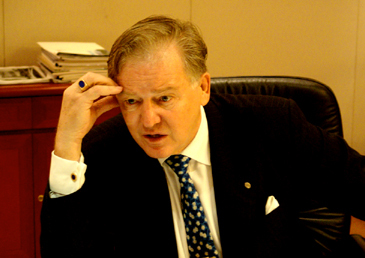 As a young man, he never dreamed of becoming the general manager of a luxury hotel. His motivations to work in this industry were to express his love for people and travel the world. 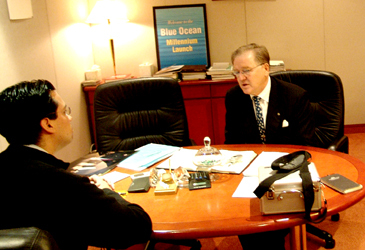 GM Bernhard Brender (right) of Millennium Seoul Hilton interviewed by Mr. Tom Pauken, associate editor of The Seoul Times in his office Sept. 20, 2005. Mr. Brender is filled with a passion for his job as well as his Roman Catholic faith. He stated, "Mother Mary made a significant impact to me during the deaths of my mother and father and helped to guide me through career crises." He participates in numerous volunteer activities with his motto being, "The answer is yes. What is the question?" He explains how he must keep earning money to give much of it away to the poor. Mr. Brender takes great pride as a family man. He married an Indonesian woman and raised two daughters. Alexandra is studying to become a pilot, while Luisa learns about the hotel industry at Ecole Hotelier in Lausanne, Switzerland. He succeeded in both business and family life. When asked what he wishes to tell the readers of The Seoul Times, he finished with a powerful quote. "Never give up! Today is the answer, do it today not tomorrow." Q1: People say that the Millennium Seoul Hilton got much better on many sides since you took charge of it. What, do you think, are your major achievements? What were the main differences from the time you started to now? A1: I have embraced the existing culture and enhanced it. Q2:What, do you think, are the greatest advantages of your hotel compared with other major hotels in Seoul? Could you also mention the areas of your hotel that need improvements? A2: We carry two powerful brands, the Millennium & Copthorne hotels and the quality Hilton family with more than 2,400 hotels worldwide, both melting together smoothly and getting a new trend in the market, supported by the enlarged group of sister hotels. Q3: What plans do you have to make your hotel an even better one for the remainder of your tenure? Do you have any interesting promotional plans? A3: Whilst the spirit of all associates grow into an entrepreneur attitude, the service level will improve and surpass all our expectation, to secure our marketing edge. Yes, our Areno Night Club will have live band to entertain young and old customers. KNTO (Korea National Tourism Organization) will operate a casino at our premises. This will enhance our product and create a new area for incoming foreigners and residents alike. Q4: According to your resume, you spend most of you career in the hotel industry particularly in Asia. What, do you think, is the best hotel in Asia, and why? Also what is the most popular hotel in Seoul in your opinion, honestly? A4: Very difficult to single out a hotel, however since you ask, of course the Millennium Seoul Hilton. Seriously, I have to mention a few of which are my favorite hotels in Asia: the Oriental in Bangkok, and in Seoul the Westin for its quality drive despite the young age of 90. Q5: What are the common problems that hotels in Korea face today? What, do you think, they should do to make them world-class hotels? A5: The foremost challenge is to control the yearly escalating labor cost. Honestly, all hotel owners in Korea driving the quality of hard and software to the level of excellence. This goes for our hotel owner Mr. Kwek Leng Beng from Singapore, who is supporting his hotel he bought seven years ago into the level of world-class property with a good profit and value added innovative drive. Q6: What made you decide to get involved in the hotel business, and why mostly in Asia? How different are the Asian values from those of the West? A6: To travel the world and able to care and serve those away from home. Q7: What were the happiest moments in your life and what were the most difficult times? A7: When guest write down my stay at your hotel was better than home, that we anticipated and delivered the walk we talk. When I was called to a guest room and after giving CPR to the guest but it was too late, I felt depressed, hopeless and defeated. Q8: Could you specify the merits of Korean people or culture and the demerits of them? A8: Korean people are devoted, dedicated, and hard working people with a great culture. We just celebrated Chuseok holiday, when Korean travel for countless hours to visit their ancestors and relative back home at their countryside and take quality time out to reflect and relax. 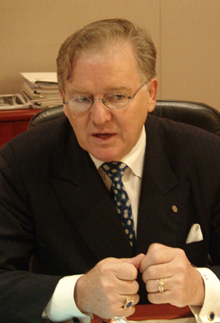 Q9: For decades you have devoted your life to the hotel business. What has inspired you to continue to work in this field? When do you plan to retire and what will you do after retirement? A9: To be able to serve multinationals under one roof and share knowledge. Time and care for them. I will never retire because there is so much to do for all those unfortunate people around us. Only God will have the last call and order to go to rest when His mission is accomplished, nobody else on earth for that personal matter. Q10: Could you tell me about your family. You are married to an Indonesian lady. What do your kids do for a living? A10: Yes, I married an extraordinary lady called Mutati from the Island of Bali. I often call her my life souvenir from Indonesia. My eldest daughter Luisa, who is 27 years old, finished the famous hotel school in Lausanne, and is married and live in San Diego. 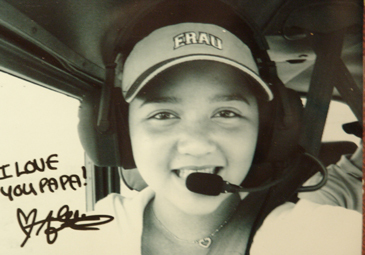 My youngest daughter Alexandra, at 18, is enrolled at the Embry Riddle Aeronautical University in Daytona Beach/Florida to become a commercial pilot, hopefully for Lufthansa one day, my motherland carrier famous for its safety and efficient service. Both of my daughters call Korea their home because of the friendly South Korean society of 48,000,000. The above photos were taken by James (Young-Ju) Huh, staff reporter of The Seoul Times.